Buena Onda is a lifestyle brand that uses social enterprise to bring love, community, and empowerment to the Wayuu People of Colombia. The Wayuu People are an indigenous people spread out through Northern Colombia and Venezuela. They are known for their beautiful hand woven products that they have been making for hundreds of years. The most famous items they make are Wayuu mochilas. A Wayuu mochila is a unique piece of art that is not replicated. They are made by hand without a loom, and it can take a Wayuu woman anywhere from ten to thirty days to complete one mochila. The patterns are specific to the woman or family that makes each bag, and the colors are made from natural dyes. For that reason, Buena Onda does not attempt to control the colors and the designs of the Wayuu mochilas. These Wayuu women infuse each bag with a part of their culture and tradition, and we want to honor that process. Kevin Kennedy first came across the Wayuu mochila while backpacking through Colombia. He immediately bought two of the beautiful bags for his mom and sister, but he had no idea that purchase would spark an idea that would change his life. Eventually that day came when the spark grew into a fire. Kevin was tired of working for the government in Washington D.C., so he quit his job and bought a one way ticket to Colombia. With a backpack in hand and a bus ticket from Cartagena to Riohacha, Kevin headed east to try and meet the famous Wayuu People of Colombia. Over the following year he would work with numerous families and create lasting friendships that would grow into the foundation of the Buena Onda company. 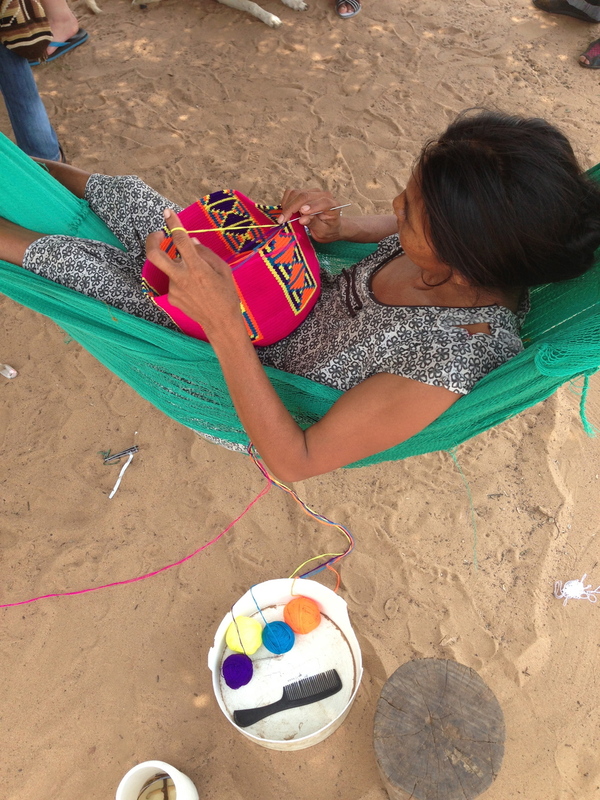 Rather than work within a traditional micro-loan framework of teaching new skills to the Wayuu communities, Kevin saw that the Wayuu had more than enough talent to support themselves; they just needed a sales channel for distribution. For that reason, Buena Onda began buying mochilas directly from the makers, while avoiding middlemen who were taking significant cuts for themselves. In turn, Buena Onda was able to pay the Wayuu women exactly what they wanted and also saved them time on travel and concerns about finding customers. Over the years, Buena Onda became very close with five families who began creating new and exiting products like dog collars, dresses, pocketed t-shirts, and guitar straps. The only requirement was that everything Buena Onda sold had to be handmade, fair-trade, and one of a kind. Today, Buena Onda is going strong and following through on its mission to bring love, empowerment, and employment to the Wayuu People of Colombia.